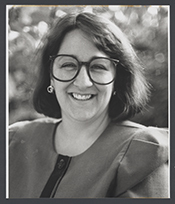 Lynn Nancy Rivers, entered politics as a “mom who got mad at the system.”1 As one of a handful of Democratic freshmen elected during the 1994 “Republican Revolution,” Rivers championed the interests of her Michigan district, as well as lobbying regulations in Congress. Lynn Rivers was born in Au Gres, Michigan, on December 19, 1956. Her father was a mailman, and her mother was a small business owner. The day after she graduated from Au Gres–Sims High School in 1975, she married Joe Rivers, who soon found work as a member of the United Autoworkers Union. The couple had two daughters, Brigitte and Jeanne; the Rivers later divorced. While working a series of low–paying jobs, Lynn Rivers put herself through college, graduating with a B.A. from the University of Michigan at Ann Arbor in 1987. In 1992, she earned her J.D. from Wayne State University in Detroit. While attending law school, Rivers served as a trustee of the Ann Arbor board of education, where she served from 1984 to 1992. In 1993, she was elected and served one term as a member of the Michigan state house of representatives. Rivers was appointed to a prestigious position on the Budget Committee in her first term. She served on the committee’s bipartisan Social Security Task Force in the 106th Congress (1999–2001) but soon concluded that the parties differed too widely to come to a consensus, charging that many of her colleagues on the task force were present merely to score points with voters.16 She gave up the Budget Committee in the 107th Congress (2001–2003) in order to take a position on the Education and Workforce panel; the committee’s jurisdiction covered two of Rivers’s areas of personal interest. Citing her own experience of putting herself through school, she opposed a measure calling for interest on student loans to accrue at matriculation instead of at graduation. She chastised the bill’s supporters, who had benefited from student loan assistance. “What hypocrisy,” she declared, “I guess it is easy to pull up the ladder of success once you and your children are safely at the top.”17 Rivers also was a passionate protector of labor. Many of her constituents were autoworkers.18 Rivers led several other Members from manufacturing districts in demanding investigations of the effect of the North American Free Trade Agreement, which opened domestic manufacturing trade restrictions between the United States and its North American neighbors. Rivers also fought a GOP proposal to allow companies to compensate employees who work overtime with extra time off rather than with extra pay. She cited employer pressure and discrimination against those who would choose pay over time off. 1Politics in America, 2002 (Washington, D.C.: Congressional Quarterly Inc., 2001): 524. 2David McHugh, “Candidates Offer a Clear Choice; She Persevered Against Adversity,” 7 October 1994, Detroit Free Press: 1B. 5Frank Rich, “The Last Taboo,” 23 December 1997, New York Times: A19. 6“8 Days Out, Roll Call’s Guide to Races,” 31 October 1994, Roll Call. 9Congressional Record, House, 105th Cong., 1st sess. (19 July 1955): 7194. 10Doug Obey, “Rep. Rivers Runs Against GOP Tide,” 26 July 1995, The Hill. 11The measure, H.R. 845, was introduced early in the 107th Congress but never cleared the Science Committee; see Congressional Record, House, 107th Cong., 1st sess. (1 March 2001): 623. 12Craig Karmin, “Chief Sponsor of Lobbying Gift Ban Legislation Defends Contribution Request to Lobbyists,” 29 March 1995, The Hill. 13Katherine Rizzo, “Democrats Turn Quiet When Asked About Handing Out Checks in the Capitol,” 23 May 1996, Associated Press. 14Politics in America, 2002: 525. 15David E. Rosenbaum, “Capital Sketchbook; A Day of Debate and Forced Allusion,” 15 September 1999, New York Times: A22. 16Politics in America, 2002: 524. 19Ethan Wallison, “Frustration Fuels Pelosi’s Whip Bid; Women Aired Concerns During Gephardt Meeting,” 14 October 1999, Roll Call. 20Katharine Q. Seelye, “Dean of the House is Forced to Face Ex–Ally in Primary,” 9 July 2002, New York Times: 16. 22Deb Price, “Dingell, Rivers Vie for Women,” 7 April 2002, The Detroit News: 13A. 24Lauren W. Whittington, “Rivers Blames Auto Industry for Primary Defeat,” 12 August 2002, Roll Call: 10. Videocassette: 1994, 1 commercial on 1 videocassette. The commercial was used during Lynn Rivers's campaign for the 1994 U.S. congressional election in District 13 of Michigan, Democratic Party. "Lynn Nancy Rivers" in Women in Congress, 1917-2006. Prepared under the direction of the Committee on House Administration by the Office of History & Preservation, U. S. House of Representatives. Washington: Government Printing Office, 2006.